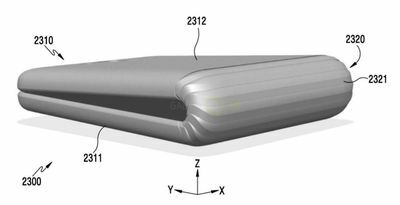 The future of Galaxy devices could lie in bendable screens as a recently discovered patent application by Samsung shows. The application was found by Galaxy Club and depicts a picture of a smartphone with a bendable mid-section meaning while it be able to twist—which is pretty ridiculous, why twist the phone—it could be able to bend in half. There will also be another display for when the device is folded. The best picture—besides the patent example—would be the old flip phones that had a main display and a smaller screen on the back of the phone so you could see the time, date, battery life and how many messages you have unread—important information. Rumors of the patent being sent into the country’s patent office date back to April and now it seems as though Samsung is at least toying with the idea of space-saving Galaxy Tabs and pocket-friendly Galaxy smartphones. If Samsung goes this route it will need to really sell the feature along with whatever else and the kitchen sink the company will be bringing out with its next phone and tablets. Another annual case of “improved battery life, better display, touch functionally, and improved camera” isn’t going to get the job done after everything with the Galaxy Note 7.